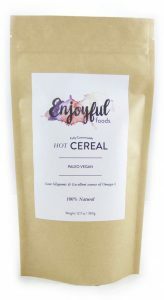 Enjoyful Foods‘ paleo vegan hot cereal is the new venture of Sandra Giraldo, Holistic Health and Nutrition Coach of Clean Food Healthy Living. Sandra’s work is to help people “feel and look better by eating healthy food that tastes delicious.” She is incredibly knowledgeable about alternative dietary preferences and restrictions, with a solid foundation in the paleo, real food, and vegan worlds, and an approach that is all about nutrient density and gut health. This is not your average food-pyramid-Choose-My-Plate-pushing “nutritionist”—Sandra is the real deal! And her raw chocolate truffles are amazing!! Sandra has begun making foods that are in line with her work: nutritious, allergen-friendly, and delicious. Her first product is a paleo and vegan hot cereal, made with green plantain, coconut, and chia and hemp seeds. I’ve been hearing about this for a while now, and was excited to try it. I was not paid to write this review. I got a free sample—kindly delivered by Sandra while walking her dog (we live in the same neighborhood)—and I offered to write this up, because I appreciate her work and want to support her. Preparing the cereal was simple: Dissolve some of the dry mix in water or milk, cook on medium until it thickens, remove it from heat and let it stand. 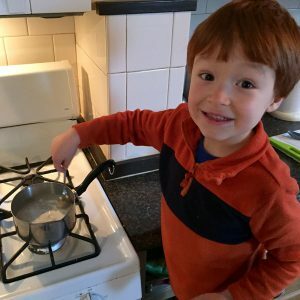 So easy even my son could help! I used raw milk, rendering the cereal neither vegan nor strict paleo, but definitely nutrient dense and real food. So I put half in a bowl with some local dried cranberries, cinnamon, and ginger. The other half, I ate on its own. While the add-ins gave it more of a flavorful umph, there was something especially addictive about eating it plain. You know how when you eat something that feels really amazing in your body? It’s not necessarily that it’s super tasty, or that it contains some additive that makes food actually addictive (e.g. processed sugar, salt, or fat)… but something basic, real, and nutrient-dense—nutrients that your body wants and needs and is thankful for. You know that feeling? That’s the feeling I had, eating this paleo vegan hot cereal, straight up. 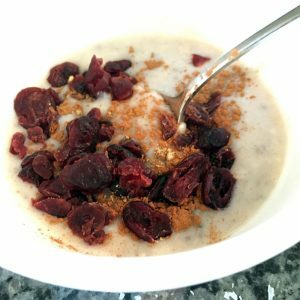 I plan on getting more, to get that feeling again, and to experiment with add-ins that even better complement this amazing cereal and its health benefits. You can learn more about Sandra at Clean Food Healthy Living, and buy her products online at Enjoyful Foods.